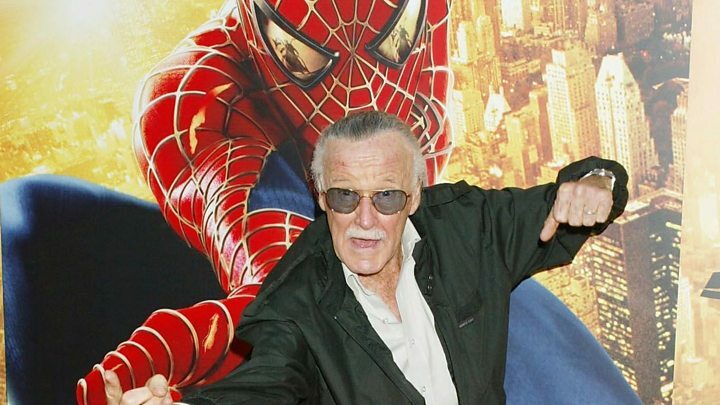 American writer and former president of Marvel Comics Stan Lee has died at the age of 95. In 1961, Lee created The Fantastic Four for Marvel Comics, and went on to create titles including Spider-Man and The Incredible Hulk. The legendary comic book author died at Cedars Sinai Medical Center in Los Angeles, according to a family lawyer. The CEO of Lee’s Pow! Entertainment praised the “father of pop culture” for inventing “universes of characters”. CEO Shane Duffy called him “a true iconic pioneer with no comparable second”. Lee’s wife, Joan, died in 2017 – also aged 95 – but he is survived by his daughter, JC Lee. Speaking to celebrity news website TMZ, JC Lee said her father was “the greatest, most decent man”. In recent years, Lee had periodically suffered from illnesses, including a bout of pneumonia, US media reported. Lee was known for making a cameo in every Marvel film, though he had left the Marvel company in 1972. He remained chairman emeritus. On Sunday, Veteran’s Day, his official Facebook page shared a photograph of Lee in the Army, noting his nickname during World War Two was Playwright. Lee was born in 1922 to working-class Jewish immigrants from Romania. He began working at the comics section of Timely Publications – a company that would eventually transform into Marvel Comics – and became comics editor there at age 18. But for years Lee wrote only simple comics focusing on crime stories, horrors and westerns aimed at young readers. At age 40, Lee decided to give up on comics. But his wife Joan urged him to create the characters he always wanted to write as his comic swansong. And in 1961, Lee and artist Jack Kirby created the Fantastic Four – compelling characters with individual personalities and relatable problems. Timely Publications was renamed Marvel and the golden age of comic books had begun. Many Marvel characters were groundbreaking at the time. For example, Black Panther was the first black superhero featured in a mainstream US comic. Other characters he created include the Silver Surfer, the X-Men, Iron Man and Doctor Strange. Lee was also known for giving artists their due credit. Kirby, Frank Miller, John Romitaand and others achieved cult status in their own right. In its heyday, Marvel sold 50 million copies a year. Until he retired from editing in 1971, Lee wrote all the copy for Marvel’s covers. Bob Iger, chairman of the Walt Disney Company, which bought Marvel Comics for $4bn (£2.5bn) in 2009, called Lee “a super hero in his own right” in a statement. Celebrities and fans have been sharing across social media how Lee and his work affected them. Hugh Jackman, who played Wolverine in the X-Men films, called Lee a “pioneering force in the superhero universe”. Evangeline Lilly, who portrayed Ant Man’s superhero partner, the Wasp, also shared a tribute on Twitter. Astrophysicist Neil deGrasse Tyson praised Lee for creating a universe full of “scientifically literate superheroes”. Tom Hardy, who stars in the latest film based on a Marvel Comics character, Venom, shared a photo of Lee on set, via Instagram.